Hiya guys! Today I’m excited to have a post from my bestest friend Tasha from her new blog Imperfect Girl Trying to Live a Healthier Life! Her blog isn’t 100% dairy free, however, she strives to eat dairy free as much as possible and almost always suggest dairy free alternatives if she does use dairy! 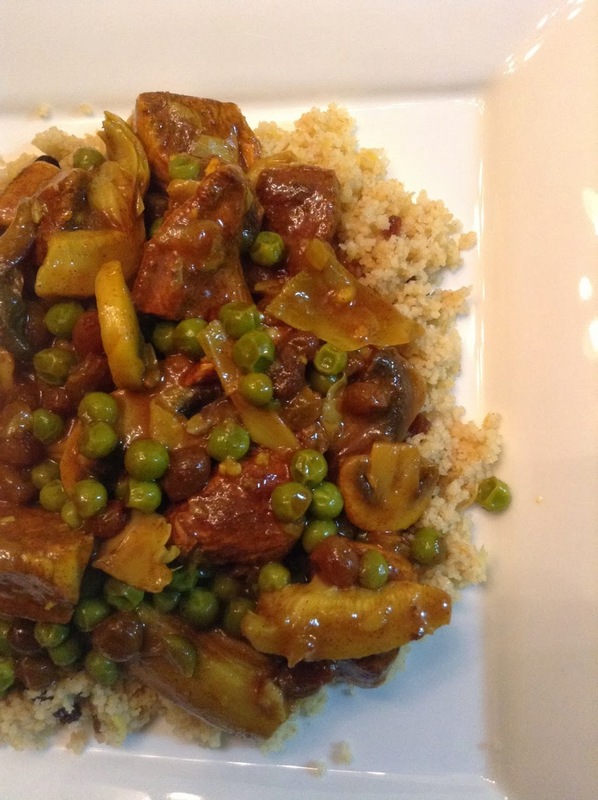 Her blog is fantastic for meal idea as she’s always posting mouth watering ideas and recipes! Also check out her facebook page here! 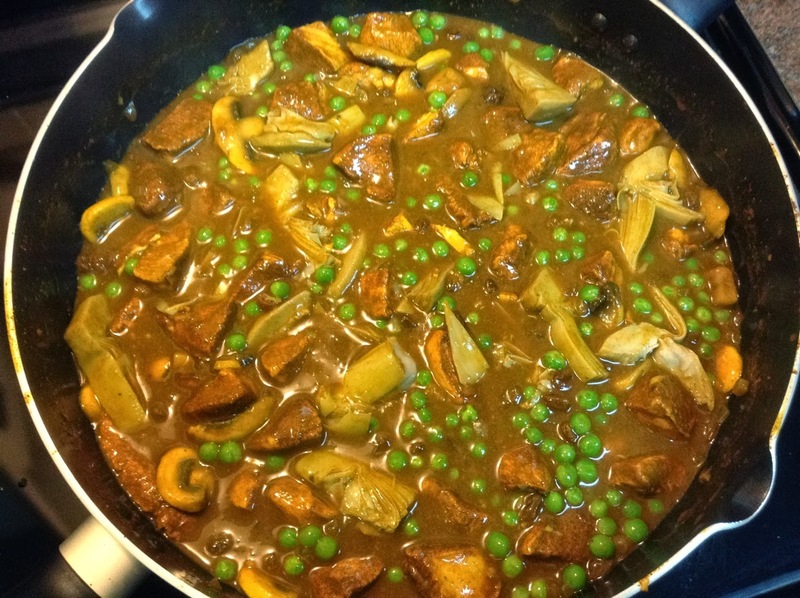 Thanks Tasha for doing this post – this recipe is mouth watering! 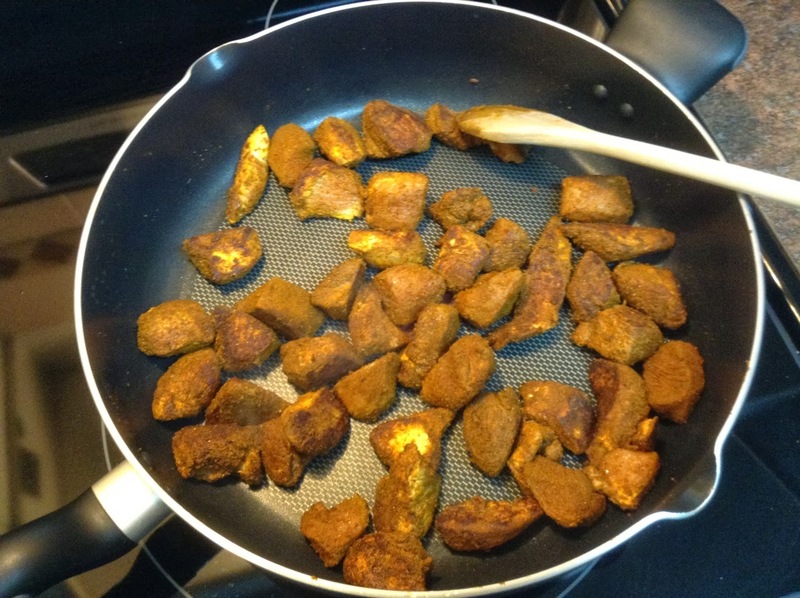 Mix together 2 teaspoons of each cinnamon, ground coriander, ground cumin, paprika, & turmeric, in a large resealable bag. Cut up 3 chicken breasts into bite sized pieces. Get the chunk wet & toss them in the resealable bag coating them with the spices. Heat 1 Tablespoon of olive oil in a large deep skillet, over medium heat. Add the chicken breast, and sauté until brown on all sides, about 5 minutes. Add 1/2 cup sliced mushrooms and 1/2 a small diced onion to the pan, cook 2 minutes. Stir in 1 tablespoon of fresh grated ginger, and a clove of chopped garlic, sauté 30 seconds, stirring constantly. Add 2 cups of chicken broth, 1 cup of pitted dates (I also use raisins when I don't have dates on hand), 1 tsp lemon juice, and a pinch of saffron threads. 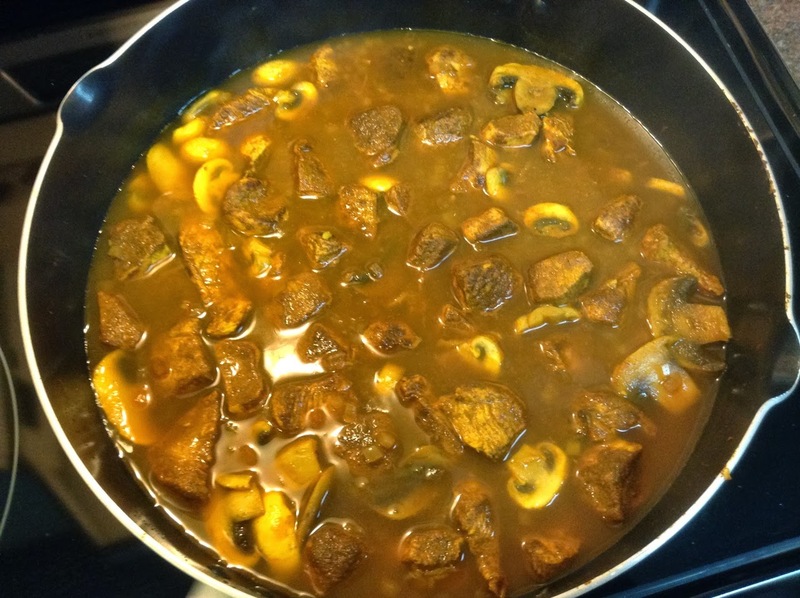 Reduce heat and simmer for 20 minutes. 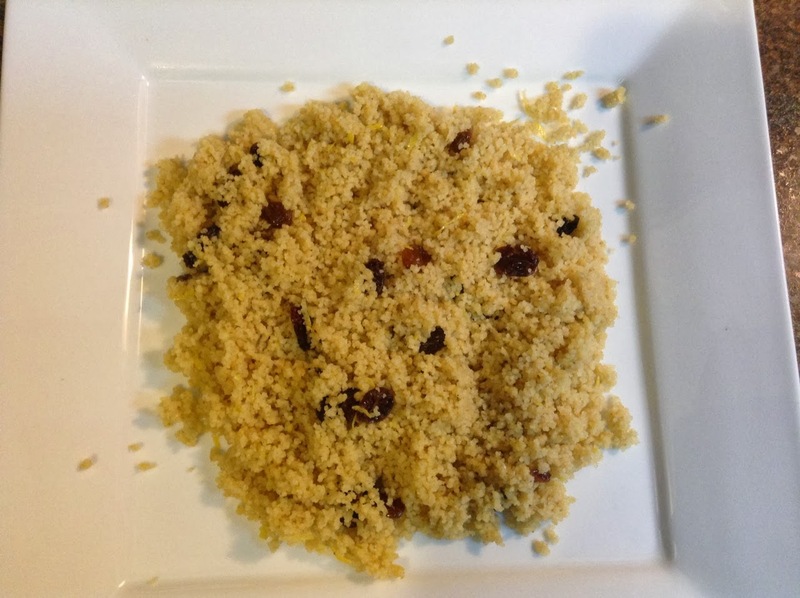 At the 15 minute point of simmering prepare couscous. In a medium sized saucepan add 1/2 cup of juice, (the original recipe calls for apple juice, but I often use orange juice. This time I used Happy Planet Mango Peach.) 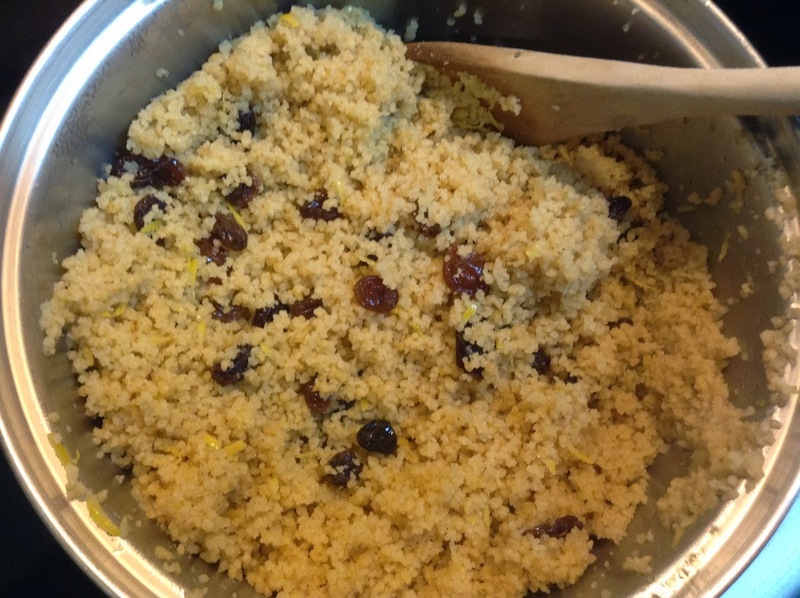 1/2 cup of chicken broth, 1/4 cup golden raisins, 2 teaspoons lemon zest, 2 teaspoons olive oil, 2 teaspoons raw honey, 1 teaspoon sea salt, and bring to a boil. 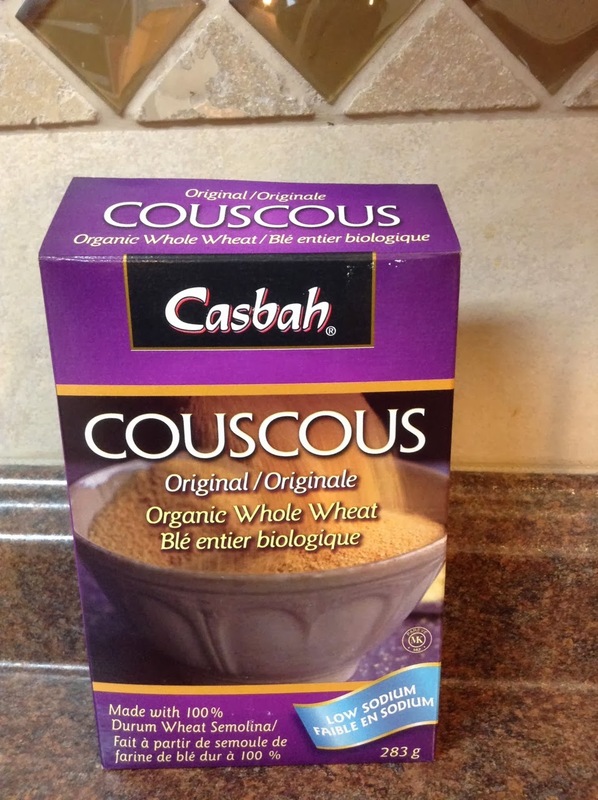 Add 3/4 cups dry couscous of choice ( I used whole wheat), stir in, cover with lid, and remove from heat. Let stand for 5 mins, and then fluff with a fork. Increase heat and add a mixture of cornstarch and water and stir in to pan. When sauce begins to thicken, add 14oz of artichoke hearts, drained and quartered, as well as 1 cup of frozen peas. Lower heat and cook for 5 more minutes. 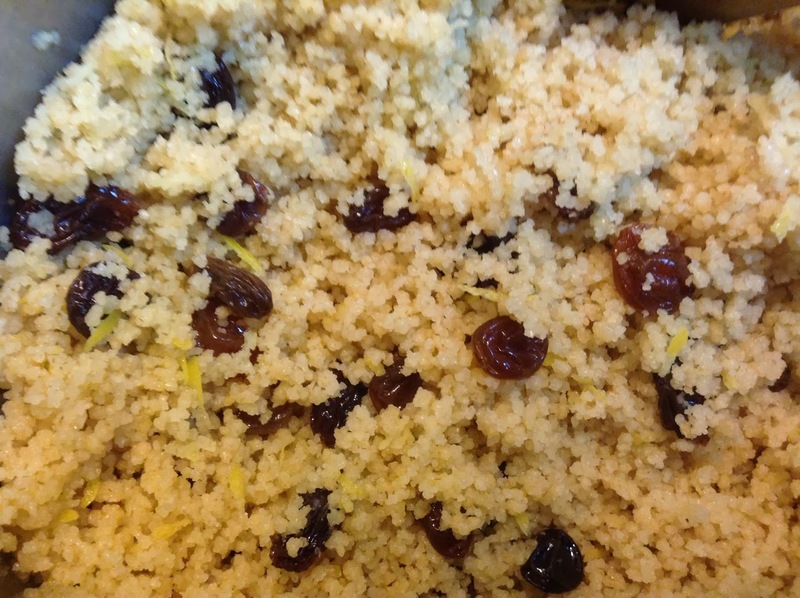 Serve over Honey Raisin Couscous. I hope you enjoy this recipe as much as I do. Enjoy! Tasha has a long list of meal ideas for when I come to visit, this is officially being added to the list! Have a great day – and my next post (hopefully) will be full of a TON of dairy free snack ideas! PS – I changed my commenting section back to how it used to be – so now everyone should be able to comment! !